The Centre offers two martial arts programs–TaeKwon-Do through Midwest Academy of TaeKwon-Do, and Kyuki-Do through Kim’s Black Belt. Both programs are highly successful and to accommodate a wider area of interest, we have added Brazilian Jiu Jitsu and Mua Thai Kickboxing, both offered through Fusion Fitness MMA. Please choose the one that best meets your personal and scheduling needs. If you are looking for a way to develop your own or your child’s self-confidence and get in great physical condition TaeKwon-Do is your answer! TaeKwon-Do will help you condition and excel mentally as well as physically! Families (parents & children) are welcome to train together! Taught by Master Instructor Dan Valin, 7th Degree Black Belt, along with Rick Brabeck 7th Dan, Jemal Crisp 4th Dan and a number of certified assistant Black Belt instructors! Classes are held at The Centre, Multi-Use Gym for ages 7 years and older. Fees vary based on the number of weeks each session and the training days. Participants can choose to attend once, twice, or three times per week. Kyuki-Do classes are taught by Kim’s Black Belt Academy instructors. Throughout the course of our training, your child will be introduced to the Martial Art of Kyuki-Do. 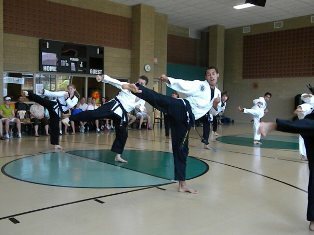 They will learn coordination and self control through the basic kicking, blocking, and striking techniques. We will emphasize gaining self confidence through doing one’s personal best. Upon mastery of the required skills, students will be given the opportunity to promote at Kim’s Black Belt Academy to attain higher rank. Uniforms will be available the first day of class for a nominal fee. Families with 3 or more participants registered for each session will get a 50% discount for the 3rd and additional family members. Parental participation requested for the kinder classes. Throughout the course of our training, you will be introduced to Muay Thai Kickboxing. You can expect to learn the fundamentals of how to effectively use the body’s natural resources: hands, elbows, knees and feet. More specifically, the fundamentals to Muay Thai Kickboxing will combine punches, elbows, knee strikes and kicks into a self-defense system designed to develop your speed, power, timing, and endurance. Students will also work with the jump rope, focus mitts and the speed bag for their boxing techniques, and the heavy bag for power and conditioning. The required equipment for class (Fusion T-Shirt, Thai Shorts, Jump Rope, Bag Gloves, and Equipment Bag) will be available the first day of class for a fee. Throughout the course of our training, you will be introduced to Brazilian Jiu Jiu Jitsu. What makes Brazilian Jiu Jitsu unique is that it focuses on leverage and proper technique as opposed to strength. In a self-defense situation, this will help neutralize a larger, stronger attacker and will enable a smaller person to successfully defend himself or herself against a bigger person. Moreover, Jiu Jitsu is a system of self-defense that teaches students how to throw and fall properly, as well as how to perform and defend against joint locks, chokes, and other submission techniques. Uniforms will be available the first day of class for a fee. The Main Courtesy Desk can assist with your registration needs such as: shelter rentals, birthday parties, course registrations, including preschool registration and payments. During all facility hours the Fitness Desk is open to assist you with all your membership and fitness needs.